Nazareth Store . - Limited edition! we provide 100% guarantee that product you order from us match exactly as image, if not we will refund you immediately! Catholic deep blue crystal beads rosary with metal crucifix Long Beaded Necklace With Madonna Medallion In The Middle And Holy Soil From Jerusalem Holy Land. Catholic deep blue crystal beads rosary with metal Crucifix Long Beaded Necklace With Madonna Medallion In The Middle And Holy Soil From Jerusalem Holy Land. Rosary length: 43 cm / 17", brand marked Nazareth Store Customized Gift Velvet Bag. Cross h x w : 4 cm x 2. 5 cm / 1. 6" x 1". Most beautiful & unique items not found in stores, Most of The items Made in Jerusalem and Nazareth the HOLY LAND Offering you High Quality Items. Don't miss your chance to have a small part of holy land in your home! Nazareth Store Deep Blue Crystal Beads Rosary Catholic Necklace Holy Soil Medal Cross Crucifix Velvet Bag - Limited Edition! . More information about Nazareth Store . Nazareth Store UK_B017HI0F5W - Most beautiful & unique items not found in stores, Most of The items Made in Jerusalem and Nazareth the HOLY LAND Offering you High Quality Items. Don't miss your chance to have a small part of holy land in your home! Beautiful Hematite Rosary. Original item From Jerusalem Holy Land. Rosary length: 45cm / 17. 7", round beads. The metallic crucifix has the word "jerusalem" engraved convexly on the back and the Medal has on One Side an icon of Virgin Mary and Holy soil of Jerusalem on the other Side with the words "TERRA JERUSALEM" engraved convexly. Beautiful hematite rosary. The chain and the crucifix are made of zinc and coated with silver, preventing corrosion. Hematite Rosary Black Stone Beads Necklace with Jerusalem Holy Soil & Cross - Size: cross: 4cm x 2. 5cm / 1. 6" x 1", purple gift velvet Bag with Nazareth Store Brand logo. The metallic crucifix has the word "jerusalem" engraved convexly on the back and the Medal has on One Side an icon of Virgin Mary and Holy soil of Jerusalem on the other Side with the words "TERRA JERUSALEM" engraved convexly. The chain and the crucifix are made of zinc and coated with silver, preventing corrosion. Original item From Jerusalem Holy Land. Nazareth Store - Original item Derived from Jerusalem Holy Land. Spiritual jewelry beads designed and derived from Jerusalem Holy Land, First Communion, birthday, Baptism, Confirmation, Use as prayer rosary and necklace Makes a wonderful gift for any occasion, friends and family members. The chain and the crucifix are made of zinc and coated with silver, preventing corrosion. Great spiritual jewelry beads designed and derived from Jerusalem Holy Land, Baptism, Use as prayer rosary and necklace Makes a wonderful gift for any occasion, First Communion, birthday, Confirmation, friends and family members. Size: cross: 4cm x 2. 5cm / 1. 6" x 1", purple gift velvet Bag with Nazareth Store Brand logo. Nazareth Store Deep Purple Beads Rosary Catholic Necklace Holy Soil & Crucifix Cross Jerusalem Velvet Bag - Original item From Jerusalem Holy Land. Rosary length: 45cm / 17. 7", round beads. Beautiful dark purple crystal beads rosary. Rosary length: 45cm / 17. 7". The metallic crucifix has the word "jerusalem" engraved convexly on the back and the Medal has on one side an icon of Virgin Mary and Holy soil of Jerusalem on the other Side with the words "TERRA JERUSALEM" engraved convexly. NZRT - Original item Derived from Jerusalem Holy Land. Communion rosary beads made of crystallized Glass perfectly designed for everyday use. Spiritual jewelry beads designed and derived from Jerusalem Holy Land, Use as prayer rosary and necklace Makes a wonderful gift for any occasion, Confirmation, First Communion, birthday, Baptism, friends and family members. Beautiful high quality rosary necklace with olive wood 8mm beads That Lead to the Holy Soil Medallion And To Metal Crucifix that hangs from a single row of beads Protective Amulet From Jerusalem Holy Land. Size: cross h x w : 4 cm x 2. 5 cm / 1. 6" x 1", rosary length: 47 cm / 18. 5". Beautiful dark purple crystal beads rosary. Nazareth Store Catholic Prayer Rosary Olive Wood Beads Necklace Holy Soil Medal & Metal Cross Velvet Gift Bag - Original item From Jerusalem Holy Land. Rosary length: 45cm / 17. 7", round beads. The metallic crucifix has the word "jerusalem" engraved convexly on the back and the Medal has on one side an icon of Virgin Mary and Holy soil of Jerusalem on the other Side with the words "TERRA JERUSALEM" engraved convexly. The metallic crucifix has the word "jerusalem" engraved convexly on the back and the Medal has on One Side an icon of Virgin Mary and Holy soil of Jerusalem on the other Side with the words "TERRA JERUSALEM" engraved convexly. We provide 100% guarantee that product you order from us match exactly as image, if not we will refund you immediately! Beautiful hematite rosary. Nazareth Store UK_B073WZZ7B5 - Don't miss your chance to have a small part of holy land in your home! Rosary length: 45cm / 17. 7". Original item From Jerusalem Holy Land. Rosary length: 45cm / 17. 7", round beads. Most beautiful & unique items not found in stores, Most of The items Made in Jerusalem and Nazareth the HOLY LAND Offering you High Quality Items. Don't miss your chance to have a small part of holy land in your home! Most beautiful & unique items not found in stores, Most of The items Made in Jerusalem and Nazareth the HOLY LAND Offering you High Quality Items. Don't miss your chance to have a small part of holy land in your home! Beautiful hematite rosary. Catholic Pink Pearl Beads Rosary Necklace 6pcs Our Rose Holy Soil Medal & Cross - Spiritual jewelry beads designed and derived from Jerusalem Holy Land, Baptism, Use as prayer rosary and necklace Makes a wonderful gift for any occasion, Confirmation, First Communion, birthday, friends and family members. Beautiful high quality rosary necklace with olive wood 8mm beads That Lead to the Holy Soil Medallion And To Metal Crucifix that hangs from a single row of beads Protective Amulet From Jerusalem Holy Land. Size: cross h x w : 4 cm x 2. 5 cm / 1. 6" x 1", rosary length: 47 cm / 18. 5". Hedi B01B5VVZG0_US - Don't miss your chance to have a small part of holy land in your home! The metallic crucifix has the word "jerusalem" engraved convexly on the back and the Medal has on one side an icon of Virgin Mary and Holy soil of Jerusalem on the other Side with the words "TERRA JERUSALEM" engraved convexly. The chain and the crucifix are made of zinc and coated with silver, preventing corrosion. Cross: 4cm x 2. 5cm / 1. 6" x 1", gift purple velvet bag with Nazareth store brand. Holy soil madonna medal and silver metal cross There are 5 decades communion rosary, 53pcs pearl Prayer Beads, and 6pcs roses that lead to the Medal & cross. Purple color rosary, the rosary hail mary beads is 6mm glass pearl beads, the our father beads is light purple color Coral Rose Shape beads, this 2 color match make this rosary looks very beautiful. Hedi 6mm Purple Color Pearl Beads Rosary with 6pcs Our Rose Our Facther Beads - The center piece material is zinc alloy with anti-silver plated, the rosary total length is 19. 3 inch49cm, Center piece size is 075 inch 1. 9cmheight, size is 1. 7 inch 4. 3cmheight, the crucifix material is Zinc Alloy with Anti-Silver plated, the rosary can wear as like necklace. The pin and chain are silver plated, just want to make sure every rosary finished in prefect condition, each pin and chain are cut and assembling by professional people, we make the rosary very slowly, never broken, the chain material is copper, wish everybody who received this rosary are delighted. Nazareth Store - Most beautiful & unique items not found in stores, Most of The items Made in Jerusalem and Nazareth the HOLY LAND Offering you High Quality Items. Don't miss your chance to have a small part of holy land in your home! Catholic pink pearl imitation Beads Rosary With 1. 6" long Beaded Necklace. Holy soil madonna medal and silver metal cross There are 5 decades communion rosary, 53pcs pearl Prayer Beads, and 6pcs roses that lead to the Medal & cross. The metallic crucifix has the word "jerusalem" engraved convexly on the back and the Medal has on one side an icon of Virgin Mary and Holy soil of Jerusalem on the other Side with the words "TERRA JERUSALEM" engraved convexly. Cross: 4cm x 2. 5cm / 1. 6" x 1", gift purple velvet bag with Nazareth store brand. Nazareth Store Mother of Pearl Catholic Rosary Jerusalem Holy Soil Medal and Cross Holy Land Velvet Bag - Don't miss your chance to have a small part of holy land in your home! Bought hanlincC rosary, your Family and Friends happy. Beautiful mother of pearl catholic rosary handmade clear high Quality Pearl With Stainless Crucifix Cross Long Necklace With Virgin Mary Medal And Holy Soil From Jerusalem Handmade Product From Holy Land. Cross h x w 4 cm x 2. 5 cm / 1. Jerusalem - Christian deep blue crystal beads rosary with metal Crucifix Long Beaded Necklace With Madonna Medallion In The Middle And Holy Soil From Jerusalem Holy Land. Bought hanlincC rosary, your Family and Friends happy. Beautiful mother of pearl catholic rosary handmade clear high Quality Pearl With Stainless Crucifix Cross Long Necklace With Virgin Mary Medal And Holy Soil From Jerusalem Handmade Product From Holy Land. Cross h x w 4 cm x 2. 5 cm / 1. 6" x 1". Catholic spiritual jewelry beads rosary, baptism, First Communion, birthday, confirmation, Worn as a necklace Makes a wonderful gift for any occasion, and Perfect Keepsake For friends or family member. Crucifix h x w : 4 cm x 2. 5 cm / 1. 6" x 1. 2", rosary length: 43 cm / 17". Deep Blue Glass Crystal Beads Rosary Necklace Holy Soil Medal Silver Plated New in Box - The metallic crucifix has the word "jerusalem" engraved convexly on the back and the Medal has on One Side an icon of Virgin Mary and Holy soil of Jerusalem on the other Side with the words "TERRA JERUSALEM" engraved convexly. Deep blue crystal beads rosary with metal crucifix Long Beaded Necklace With Madonna Medallion In The Middle And Holy Soil From Jerusalem Holy Land. Rosary is 21" long. Green crystal beads rosary with metal crucifix Long Beaded Necklace With Madonna Medallion In The Middle And Holy Soil From Jerusalem Holy Land. Holy Land Collection B01M6V7ZK5_US - Please note: beads color and textures can be slightly different, it belongs on the age of olive tree. The chain and the crucifix are made of zinc and coated with silver, preventing corrosion. Rosary length: 45cm / 17. 7", comes in purple gift velvet bag with Nazareth Store brand logo. Catholic spiritual jewelry beads rosary, confirmation, First Communion, birthday, Baptism, Worn as a necklace Makes a wonderful gift for any occasion, and Perfect Keepsake For friends or family member. Crucifix h x w : 4 cm x 2. 5 cm / 1. 6" x 1. 2", rosary length: 43 cm / 17". Beautiful dark purple crystal beads rosary. Catholic pink pearl imitation Beads Rosary With 1. 6" long Beaded Necklace. The chain and the crucifix are made of zinc and coated with silver, preventing corrosion. Saint images on the Gift Box may vary from one Rosary to another. BLESSED CATHOLIC ROSARY NECKLACE Olive Wood Carved Beads With Jerusalem Soil & Cross Crucifix in Gift Box, Brown - That's why we put the rosary in this beautiful gift box, as we know people buy rosary, except for themselves, Friends, also bought as gift send to their Family, then put in Purple Color Round Metal Gift Box, you do not buy another gift box after you bought this rosary. People bought this rosary used for pray, hope to make you happy, Wedding gift, Baptism, Children's first communion rosary, Brithday gift. NZRT - Rosary length: 45cm / 17. 7". Deep blue crystal beads rosary with metal crucifix Long Beaded Necklace With Madonna Medallion In The Middle And Holy Soil From Jerusalem Holy Land. Rosary is 21" long. Blessed catholic rosary necklace olive wood carved beads With Jerusalem Soil & Cross Crucifix in Gift Box. We provide 100% guarantee that item you order from us match exactly as image, if not we will refund you immediately Beautiful hematite rosary. Don't miss your chance to have a small part of holy land in your home! Rosary comes in purple gift velvet bag with Nazareth Store brand logo. Spiritual jewelry beads designed and derived from Jerusalem Holy Land, birthday, Confirmation, Use as prayer rosary and necklace Makes a wonderful gift for any occasion, First Communion, Baptism, friends and family members. Green Crystal Beads Rosary Necklace | Catholic Jerusalem Holy Soil Centerpiece Medal & Cross in Velvet Bag | Long Rosaries Design - Beautiful high quality rosary necklace with olive wood 8mm beads That Lead to the Holy Soil Medallion And To Metal Crucifix that hangs from a single row of beads Protective Amulet From Jerusalem Holy Land. Size: cross h x w : 4 cm x 2. 5 cm / 1. 6" x 1", rosary length: 47 cm / 18. 5". Bought hanlincC rosary, your Family and Friends happy. Christian Brands - Original item Derived from Jerusalem Holy Land. Communion rosary beads made of crystallized Glass perfectly designed for everyday use. Gift for catholics, Women, Men, Teens, Adults, Seniors. Great way to carry / protect your most precious rosary! The chain and the crucifix are made of zinc and coated with silver, preventing corrosion. Spirituality and jewelry craftsmanship in their finest form. Classic religious design - communion crystal beaded jewelry necklace, traditional beauty & classy silver plated centerpiece medal with holy dirt and Jesus crucifix makes this Catholic rosary looks and feels heavenly. Long catholic necklace rosary - length: 19" / 48cm bead size 8mm, cross H X W : 4 cm x 2. Autom Blue My Rosary Zippered Pouch with Stamped Gold Celtic Cross Design - 5 cm / 1. 6" x 1. 2" - with Branded Velvet bag. The metallic crucifix has the word "jerusalem" engraved convexly on the back and the Medal has on One Side an icon of Virgin Mary and Holy soil of Jerusalem on the other Side with the words "TERRA JERUSALEM" engraved convexly. Holy soil madonna medal and silver metal cross There are 5 decades communion rosary, 53pcs pearl Prayer Beads, and 6pcs roses that lead to the Medal & cross. Most beautiful & unique items not found in stores, Most of The items Made in Jerusalem and Nazareth the HOLY LAND Offering you High Quality Items. Don't miss your chance to have a small part of holy land in your home! 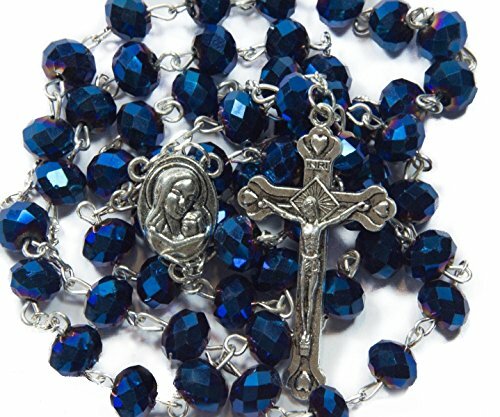 Deep blue crystal beads rosary with metal crucifix Long Beaded Necklace With Madonna Medallion In The Middle And Holy Soil From Jerusalem Holy Land.